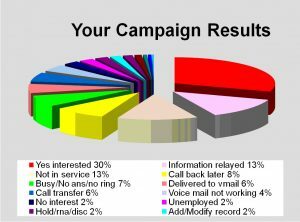 Email Email and Direct Mail campaigns are not enough….according to our existing Seminar Management clientele. We specialize in increasing Seminar attendance levels by 30% to 40%. It has been proven, event attendance will increase with a personal phone call reminder, just days before the event date. Email gets caught in spam filters, or lost with the daily 100 other emails received. Direct mail ends up at the bottom of a pile of other mail. A phone call reminder works because people’s lives are very busy and tend to forget. Our call center will call everyone on your list to ensure registration. You’ll be on-top of your campaign, and know your costs in advance. Our live call center delivers your message 100% on every call, guaranteed! This keeps your throughput High, and your costs Low. We can make thousands of personal calls for you on a daily basis to help make your event more successful. A personal call will certainly personalize the reminder notice. We read a script to a live recipient, or drop a message in their voice mail. The message can be that of your own voice.